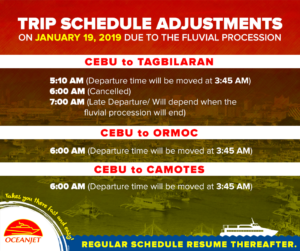 Sinulog Festival, one of the most celebrated religious festivals in the Philippines, is fast approaching and as we all know a Fluvial Procession of the Miraculous Image of the Santo Niño will be held prior to the Festival Proper. Please be advised accordingly. For more questions or clarifications regarding this matter, kindly email us back or call our hotlines: (032) 255-7560 / 0917-638-0000 / 0922-857-5500. Our Customer Service is available only from 4:30 AM until 6:30 PM everyday.